Many medical publications report the superiority of a plant based diet. Maybe it's the phytochemicals. Maybe it's the antioxidants. Maybe it's the fiber. Maybe it's magic. There are many possible explanations. But there is one very specific reason that plants reduce hypertension and cardiovascular disease. And that reason is that plants, with few exceptions, have a high potassium sodium ratio. Exceptions often help prove the rule. There have been several population based exceptions to the superiority of a plant based diet. One is a population of carnivores who have as low a prevalence of cardiovascular disease and hypertension as vegetarians. The other is a pair of populations with a plant based diet who have the same prevalence of cardiovascular disease and hypertension as Western omnivores. The carnivores with a low prevalence of cardiovascular disease are the Inuits (Eskimos). As their diet has shifted to a more Western diet they have developed the same prevalence of cardiovascular disease and hypertension as modern Westerners. Early studies of the Inuits in their traditional setting however were so remarkable that they spawned many subsequent studies centered on polyunsaturated fats. The potassium sodium ratio of the Inuit diet was mostly ignored until relatively recently. When potassium and sodium were studied, it was found that the traditional Inuit diet had a high potassium sodium ratio. The wild fish and game that comprise the traditional diet provide a high ratio diet. The Inuits who maintained a more traditional diet had a much lower incidence of hypertension than those who had switched to a more Western diet with its low potassium sodium ratio. A more extensive discussion is found in this post. We have discussed two populations eating a plant based diet that have a prevalence of cardiovascular disease and hypertension equivalent to the Western world. You can find a more extensive discussion in posts here and here. The first population is the Korean population. They eat far more vegetables than found in the typical Western diet. But because the vegetables have a large amount of sodium added, the Koreans have a prevalence of hypertension similar to the Western prevalence. And yes, they suffer the consequences of that increase in hypertension. The number 1 and 2 killers in Korea are stroke and coronary heart disease (1). The second population eating a plant based diet with a high prevalence of hypertension is the Indian population. An estimated 30 to 50% of India is vegetarian. Yet they have a prevalence of hypertension of 33% in the cities and 25% rurally. One group of Indians, the tea garden workers, have a prevalence of 46 to 61%. Indians add salt to many dishes. Their average salt intake is 10 grams a day. In one study the tea garden workers were found to consume 20 to 30 grams a day. Many of those promoting a plant-only diet are satisfied by simply showing that those eating more plants have a health advantage over omnivores eating a typical Western diet. However it is important to study what it is about plants that gives this advantage. Otherwise those practicing a plant only diet can go wrong and wind up eating the type of diet found in Korea and India. There are many components of plants that may contribute to a healthy diet. Plants are nutrient dense with a variety of vitamins, minerals and phytochemicals. They are low in saturated fat, with few exceptions. Many are high in fiber and have slowly absorbing carbohydrates. However, there is one characteristic plants have that is most certain to contribute to health. A high potassium sodium ratio, as found in the great majority of plants, has been shown time and again to improve health. 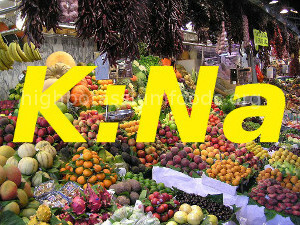 A large number of basic science studies show the mechanism by which the potassium sodium ratio affects cellular function. These studies provide an underpinning unmatched by any of the other potentially healthful components found in plants.